Hey everyone! 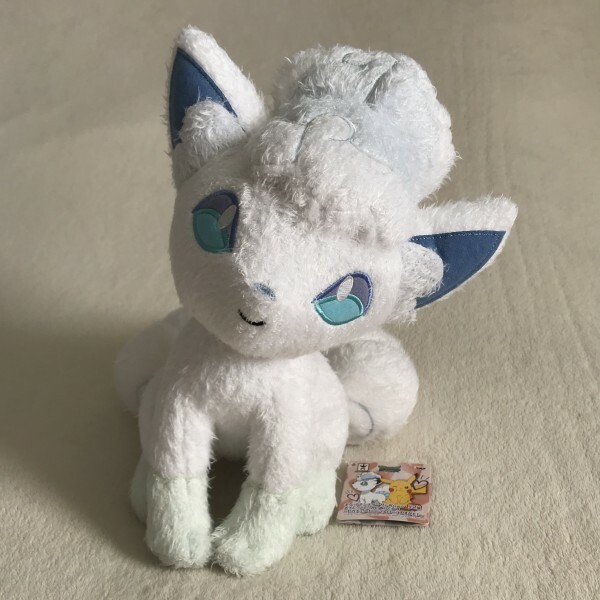 Those new Alolan Vulpix plush that I mentioned in my previous post arrived (a lot earlier than the expected date of arrival!). Just wanted to show them off and give quick reviews, but before that just a small announcement- I'm going to try something different and have a Pre-Valentine's Day Special at my sales post. 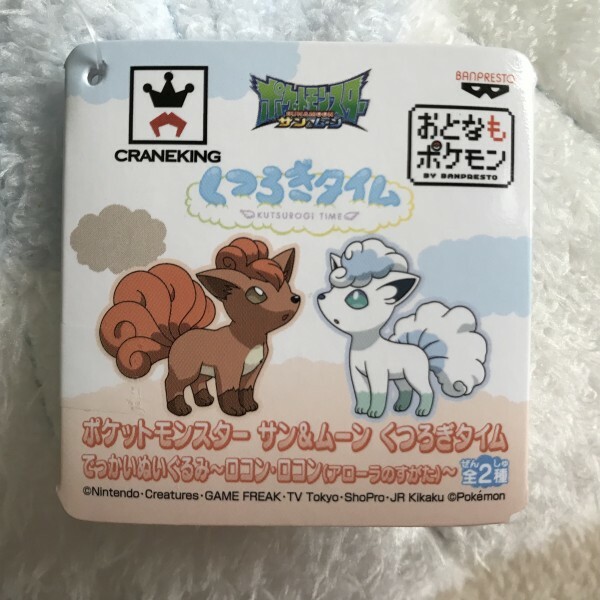 Basically I am offering free shipping under certain conditions for a limited time, full details can be viewed at the top of my sales post https://zeraora.livejournal.com/509.html. Unlike the two 2017 Banpresto Alolapix plush which were made of velboa, this plush is actually made of a softer material. Definitely a better feel to it. Eyes, nose, mouth, paw pads, and the sides of the tail showing the curls are embroidered. I don't have exact measurements right now but it's a bigger plush, but not too big... so I guess in between medium to large size. 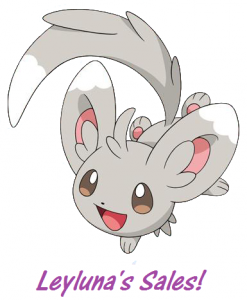 It can sit up on its own however you'll need to prop its tail for support, else it will flop to the side. Pretty good for display and/or cuddles. I think this is my most favorite Banpresto plush of Alolan Vulpix out of all that's been released to this date. Same soft fabric as the Banpresto plush above, but also much rounder, squishier, and more cuddly IMO. 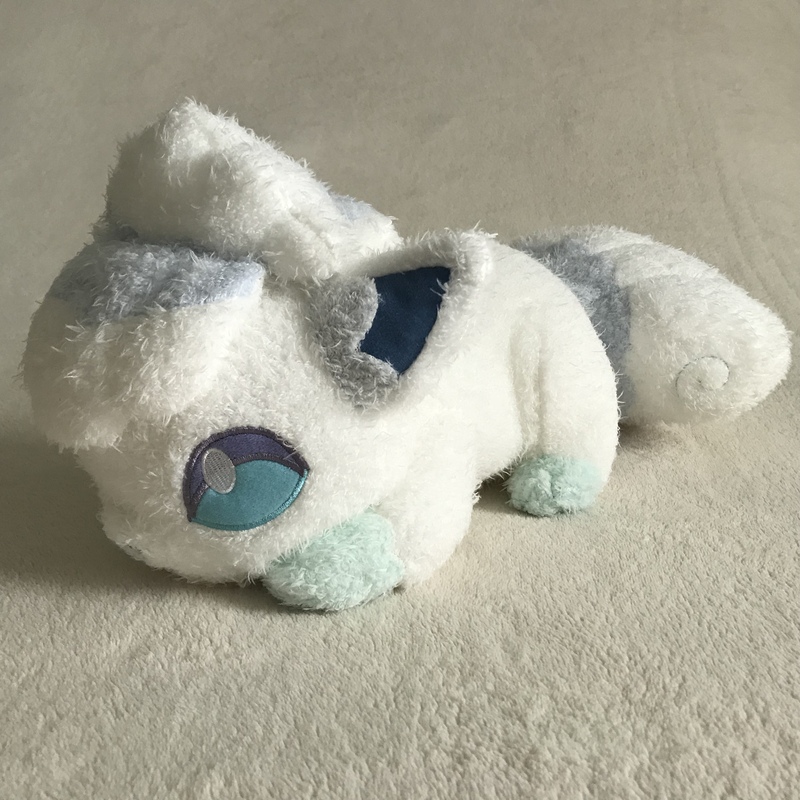 I'd say this plush is tied with the 1:1 as my most preferred Alolapix plush to cuddle and if I could I'd get another one just for that purpose. Eyes, nose, mouth, paw pads are embroidered. One eye is actually closed or winking while the other is open as seen in my photo. It's another medium to large size, maybe even slightly bigger than the previous Banpresto due to being rounded. 100% perfect for display or your next cuddle buddy. 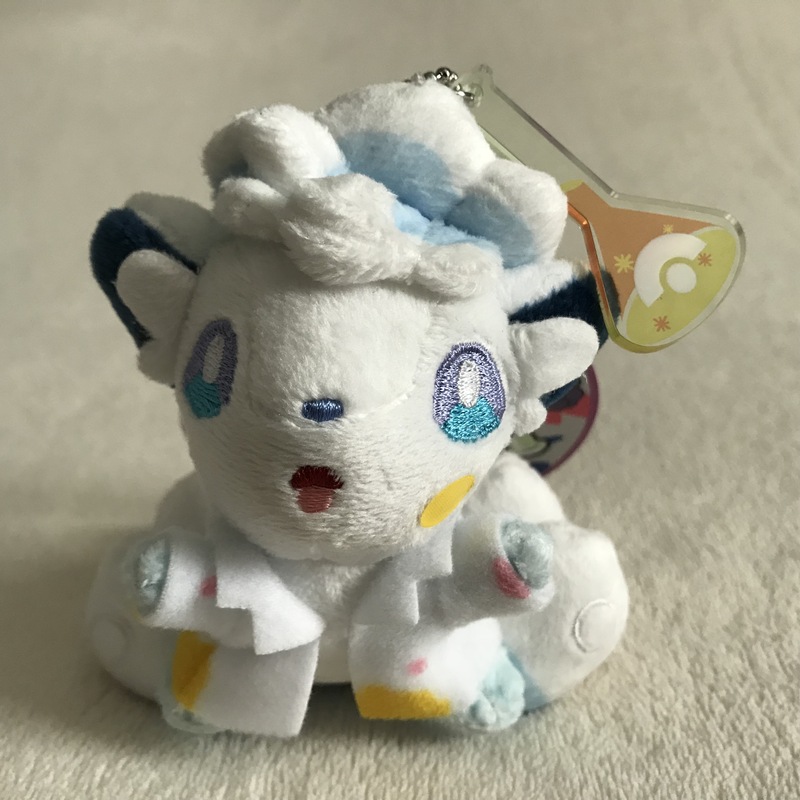 If you collect Alolapix, do not pass up this plush! Finally a new pose for an Alolapix plush mascot! 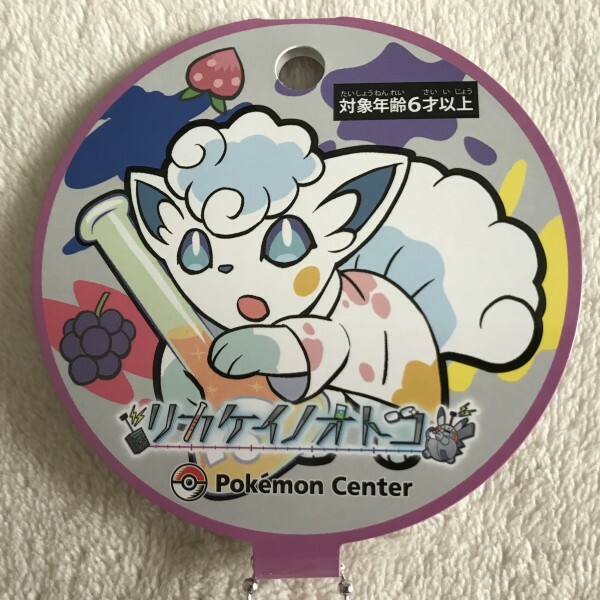 Like the usual PC plush mascots this Alolapix is mostly made of minky with embroidered eyes, nose, and mouth. The lab coat is actually made of a different, rougher material and the random yellow spot on its face is a sticker. It can stand up like as is in my photo however it takes some balancing with the tails, but plush mascots in general are mostly meant to be hanged up anyway. 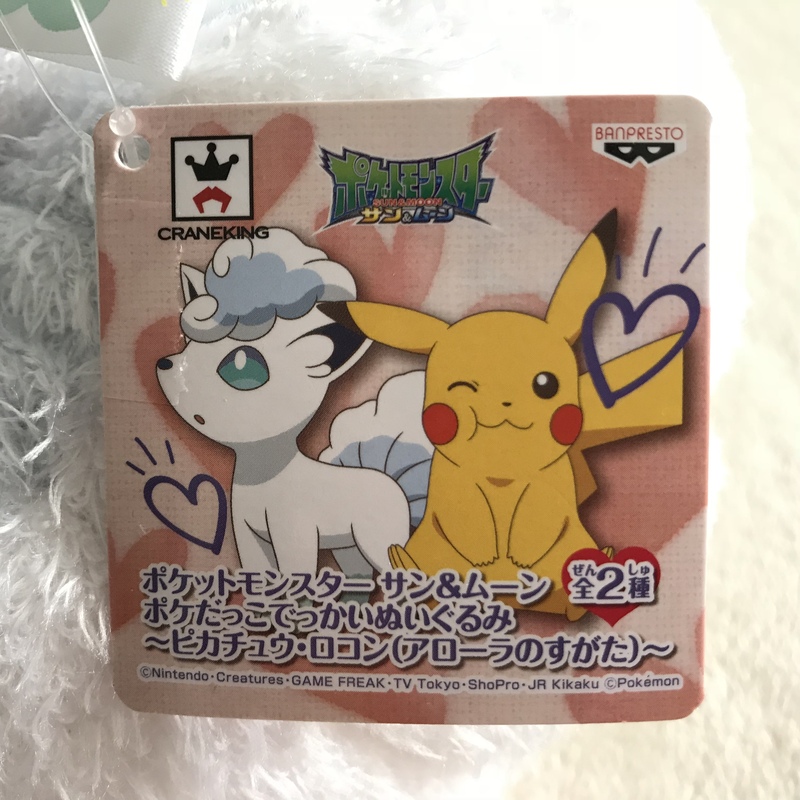 I'm not a huge fan of stickers or anything that can get peeled off plush easily, but I still think this little Alolapix is cute. Hope you enjoyed the reviews! A New (Shiny?) Mirage Poliwhirl Appeared! I just wanted to share my new European Mirage get that i received today. I haven’t seen any other like it. He is made in Italy and his eyes are made from hard plastic. He also has a loop to hang him from. Also seems to be made from the same fabric as my big snorlax, Charmander and Squirtle. 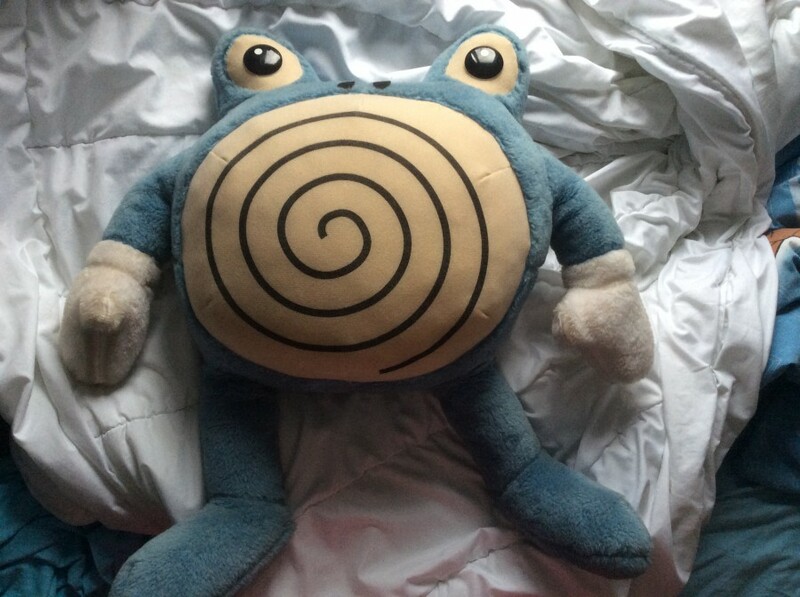 I assume he is Shiny because the original Poliwhirl is a lot darker. Although i have seen some lighter colored plush. So i could be wrong. More pics and info under the cut! Heyo! It's been a long time since I last posted here. I used to collect Pokémon a lot back in the day, but nowadays I have other things to focus on. So instead of my collection just sitting in boxes, I'd like for people to be able to enjoy it! I also have a huge Deoxys collection, let me know if you're looking for anything. Anyway, let's go! Edited- sorry if pictures weren’t working!